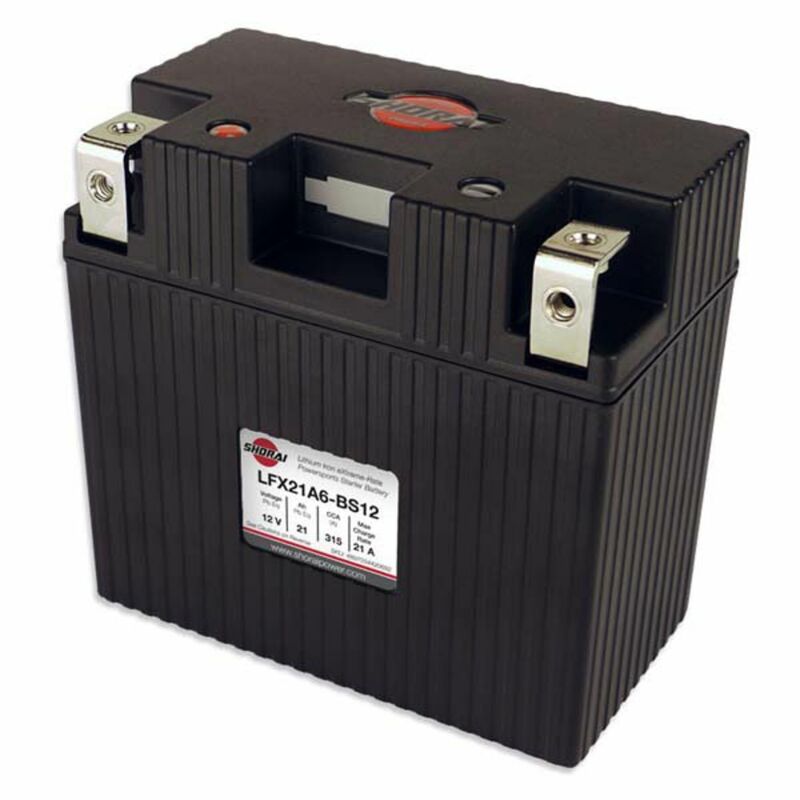 This is the heavy duty LFX21A6-BS12 battery. It offers an incredible 315 C.C.A., and the Lead-Acid Equivalent of 21 amp hours. It weighs in at only 3.03 pounds and yet still has the power to spin over even the most stubborn engines. Not only does this battery offer incredible advantaged over the lead-acid battery in weight, but also in physical size. This battery will effectively take the place of a YTX20CH in power, but it is not larger than a YTX16 battery. Do you own the LFX21A6-BS12? Please, tell us what you think about it. It helps us provide you with better products. Please note that it may take up to 72 hours for your review to appear. Pros: This battery is simply amazing! I have a 2007 Kawasaki ZX-14 and on average, I replace batteries every year or two. This particular battery has much more capacity than the stock lead acid battery, but the replacement spec wise for my bike was quite a bit smaller and although Thea come with a huge selection of foam pads to shim them to size, I was lazy and bought this battery which has almost the exact same sizes as the stock battery. The biggest shock to me is the weight. I you were handed one and didn't know what it was, you would expect it was a hollow display. Seriously, the weigh difference has to be felt to be believed! My bike lights right up every time and although it was never really a fear before, I certainly have no worries about having enough power to start the bike. I just wish I could get it out easier to show people it's almost a shame that the battery is so difficult to get to as I want to show it off. Cons: The ONLY negative I can come up with is that it costs three times as much as the lead acid it replaces, although if you were to use the foam that comes with these and get the smaller battery, you could save a few dollars that way. Other than the cost, I would have these lithium batteries in everything I own, and who knows, I just might start heading that direction anyway. Pros: Quality built, lightweight and charged when delivered with multiple self-stick pads for fittment that double as shipping material. The CCA of the battery is amazing and for large CC or high compression motors. Having put one of these in my Ducati 1098R 2 years ago, which is high compression big bore, it starts every time now. Cons: Not really a CON but, wish they would provide the Charger lead for the battery although is is an accessory that comes with the charger and can be obtained seperately. When used on the Valkyrie the thin pad is used on the bottom, front & back as well as one side. I put the thin self-stick pad on the positive side to align the cables. What's also cool is that they have double screw down locations and a spare post extension... I used the short screws to attached the Battery Tender and Heated Gear cables. Screwig down the bike plus/minus cables with only the USB asscessory lines... so they gave the battery posts some thought versus the standard lugs. the battery post screw down is also a threaded hole versus a nit. THANKS. Pros: The lightest motorcycle battery ever, with the highest CCA. In fact, it feels so light in your palm, you'd think the shell is empty. Very complete and neat Shorai Kit, with everything one could possibly ask to perfect a clean installation, including on board charging. I paid that much for just another lead acid garbage battery that did not even have a set of bolts with it. Shorai Kit is truly impressive. Finally I found a battery, capable of cranking my Vulcan 2000 motor with ease. With the Shorai charger for easy maintenance charging and storage - it doesn't get better than this. Definitely the way to go forward with motorcycle batteries. The foam and hardware kit that comes with the battery is second to none. Period. The charger kit comes with an on board charger cable, weather and dirt resistant, fully molded plug on one end, molded and capped on the other (which connects to the charger), which I could tuck away easily under the left hand side cover of my Vulcan 2000. A clean and complete solution. Don't experiment with other chargers.